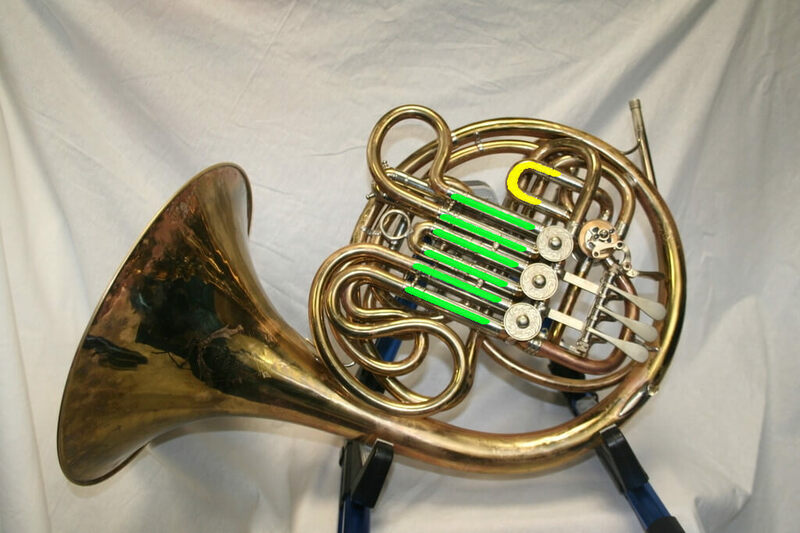 This post was inspired by a recent post made by John Ericson over on his Horn Matters site. 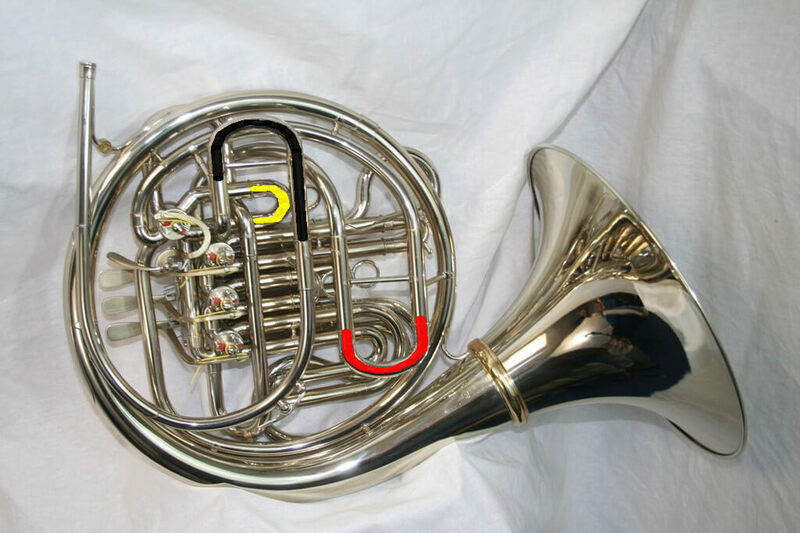 Tuning the French horn (and intonation in general) is not the easiest concept to understand for some students, especially considering the variety of models of French horns, many with different slide arrangements. Even if you know that you’re flat or sharp, knowing the exact slide to adjust can feel like a coin toss! 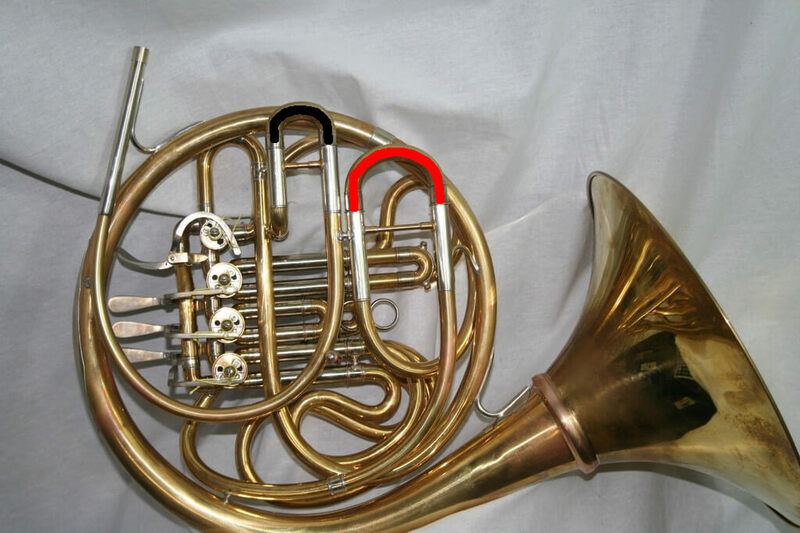 This page should hopefully not only give you an idea of how to tune the double horn, but also give an overview of what the different slide arrangements for different models of French horns. Most double horns feature at least the following slides: the main tuning slide, an F tuning slide, and six slides for the valves (3 each for the F and Bb side). You can find the exact slide arrangements (and which slide does what) at the bottom of this page. Pick the notes you are using to tune carefully. You want to pick harmonics that are relatively in tune and are in a middle register. If the notes are low, they are easy to bend with the lips; too high and they can tend to be sharp if the embouchure is overly tense. In general, 6th and 8th partials are probably the best to use unless specific extremes need to be tuned. The right hand has more control over the pitch of the horn than any slide. Make sure that your hand position is both correct and consistent. If it’s not correct, the pitch will vary widely from low to high registers; if it’s not consistent, taking the time to tune will be undone whenever the right hand is placed in a slightly different position. Make sure to use a good tuner. While you can certainly buy inexpensive tuners for $20-$50, I generally recommend you stick with an app. In general good tuning apps are less expensive and more flexible than a dedicated tuner. You can find some of my recommendations on my Apps for Musicians page. 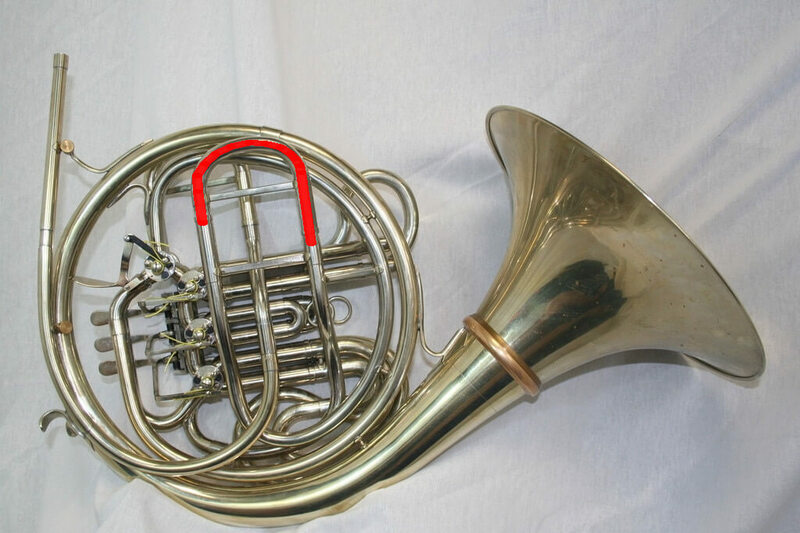 Okay – with those two things out of the way, here’s the best tuning procedure for most double horns. 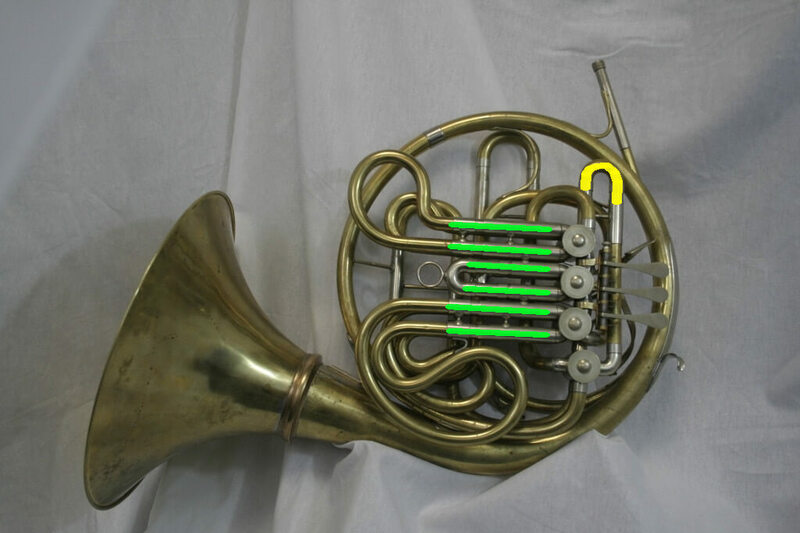 First, you’ll need to tune the open Bb horn. Use 3rd space C and top line F (the 6th and 8th partials of the open Bb horn), and adjust the main tuning slide until those notes are both in tune. Keep in mind the 6th partial (3rd space C) is a slightly sharp harmonic, so it’s okay if they aren’t both perfect. When tuning, make sure to find the center of resonance and adjust the main tuning slide to bring that center of resonance to “in tune”. Don’t bend the pitch with your lips (or right hand). 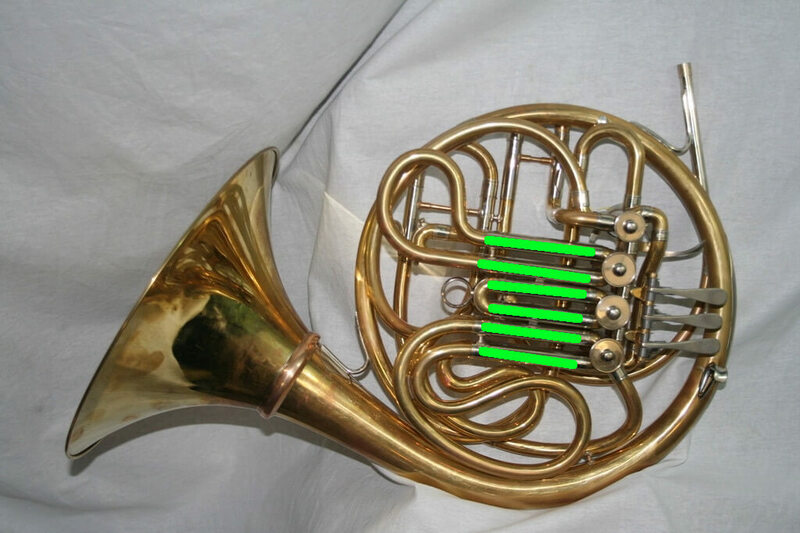 Next, you’ll need to tune the open F horn. 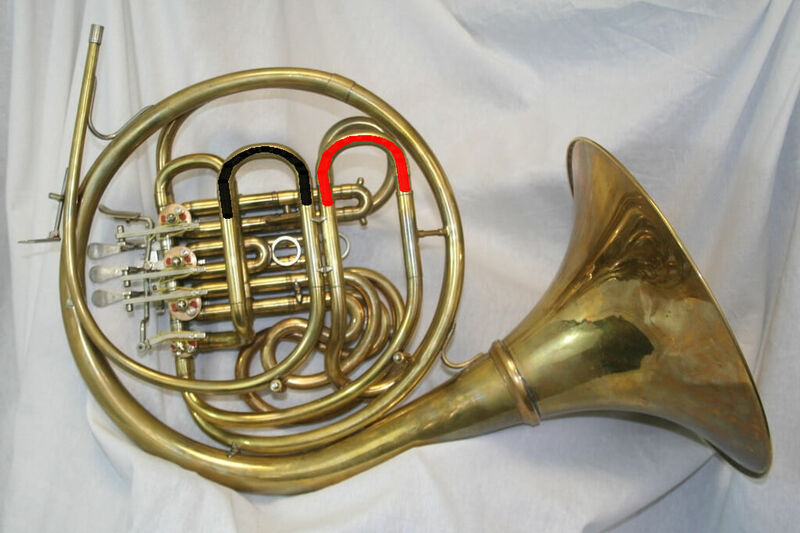 Use the second line G and 3rd space C (6th and 8th partials of the open F horn) and adjust the F horn tuning slide to bring those notes close to in tune. For some horns, the 3rd space C is a bit weird (we don’t use that range of the F horn much), so you may need to use the middle C (4th partial) and G. The 4th partial is even easier to bend sharp or flat, though, so you’ll need to pay more attention to playing in the center of the horn’s resonance for these lower notes. Now, you can tune the valve slides. I like to start with the second valve since that’s just a half step below the notes we just tuned. Start with the Bb 2nd valve and then do the F second valve. Tune these notes (remember, 6th and 8th partials) with the second valve slide. 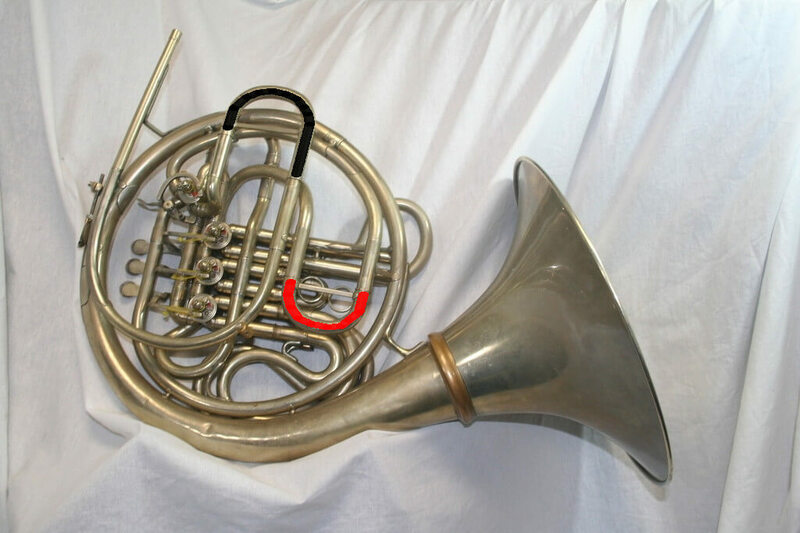 Usually, the Bb horn slide is on the bottom and the F horn is on the top. After the second valve, follow the same procedure with the Bb and F horn first valve. Remember to adjust these notes using the first valve slide. With the first and second valve slides tuned separately, now we need to do the 1-2 combination. Since multiple valve combinations are naturally sharp, if we tune the 1-2 combination to be perfectly in-tune, the individual valves will be flat (and if the individual valves are in tune, the combination will be sharp). So we’ll split the difference between the single and combination “in-tune” setting, and divide the pull between the first and second valves. This way nothing will be perfectly in-tune (it never is! ), but everything will be very close. To do this, mark (lightly with a pencil) the slide position of the valve slides. Then while playing your 6th and 8th partials pull your first valve slide until the 1-2 combination is in tune. Mark that position. Put the first valve slide back in its single valve position, and repeat tuning the 6th and 8th partials while pulling only the second valve slide. Mark this position. Put both the first and second valve slides to about halfway between the inner and outer marks that you made. We’ll tune the 2-3 combination by pulling only the third valve slide. We hardly ever use the 3rd valve alone, so it’s usually no problem to pull this slide out enough to get the 2-3 combination in tune. If you do use 3rd valve alone and find this is too flat, you can follow the procedure for the 1-2 combination and split the 3rd valve difference. Since the 1-3 and 1-2-3 combinations are so rarely used (and you can assume they will be quite sharp), there’s not much reason to worry about tuning them. Remember, the main tuning slide controls both the Bb and F horn tuning, so if you find you need to tune only the Bb side of your horn, you’ll have to adjust both the main and F tuning slides. 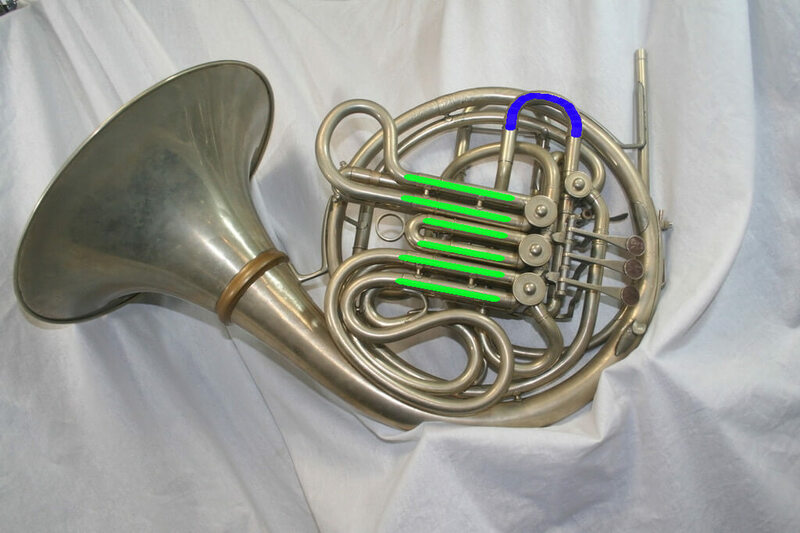 If the whole horn is sharp or flat, you can simply adjust the main tuning slide. Before you begin, go ahead and pull the main tuning slide out about ½ of an inch. 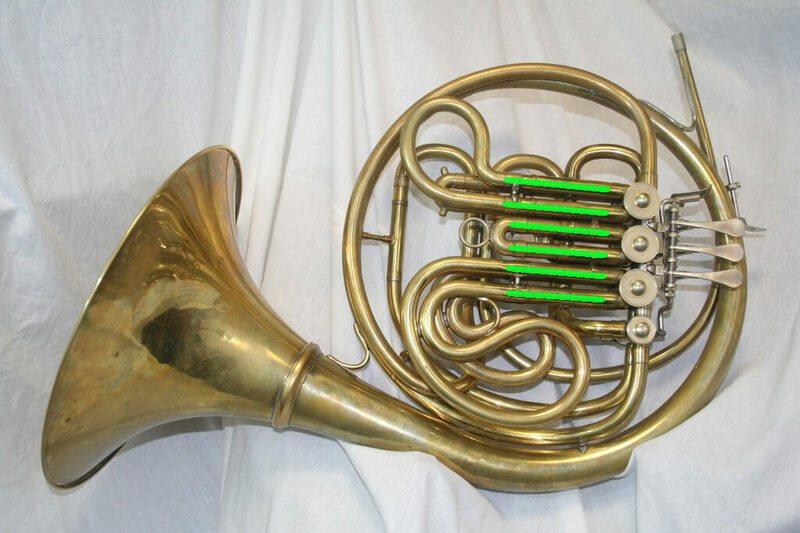 This will give you the ability to both raise and lower the pitch of the entire horn once you get it in tune. 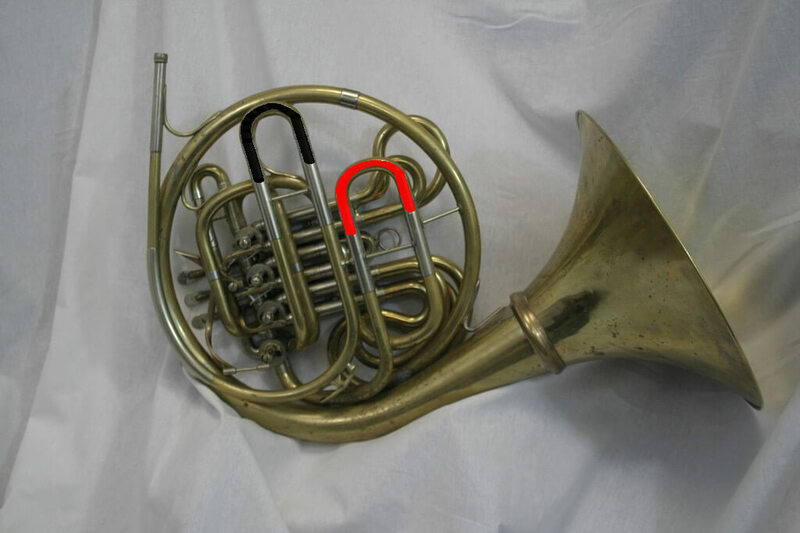 When tuning the Bb side of the horn, instead of moving the main tuning slide, move the Bb tuning slide. The procedure for the F side (and all the valve slides) is exactly the same. 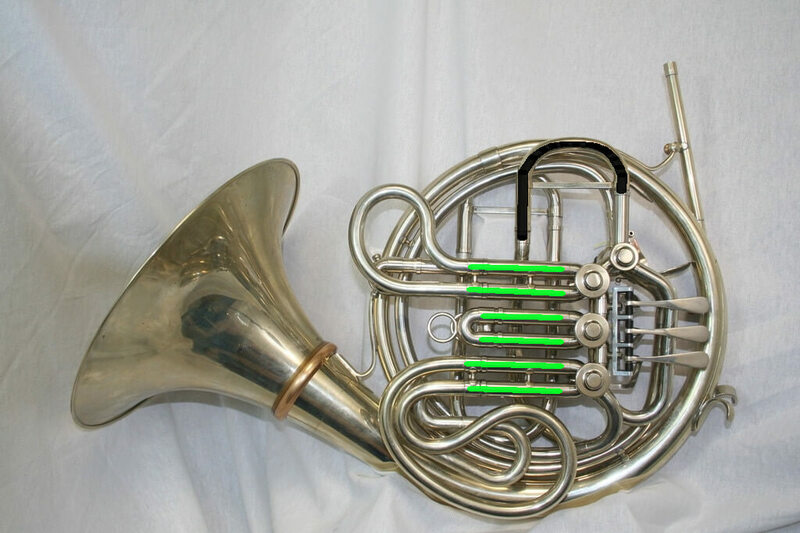 With independent Bb and F tuning, you can easily adjust the pitch of both the F and Bb sides of the horn without worrying about how adjusting the main tuning changes the F horn pitch. While you don’t have to tune the Bb side of the horn first with independent Bb tuning, it’s still a good idea to get in the habit of doing that. A few more things to think about when tuning your horn (or the horns of your students). In general, concert A (E for French horns) isn’t a great note to use for tuning. 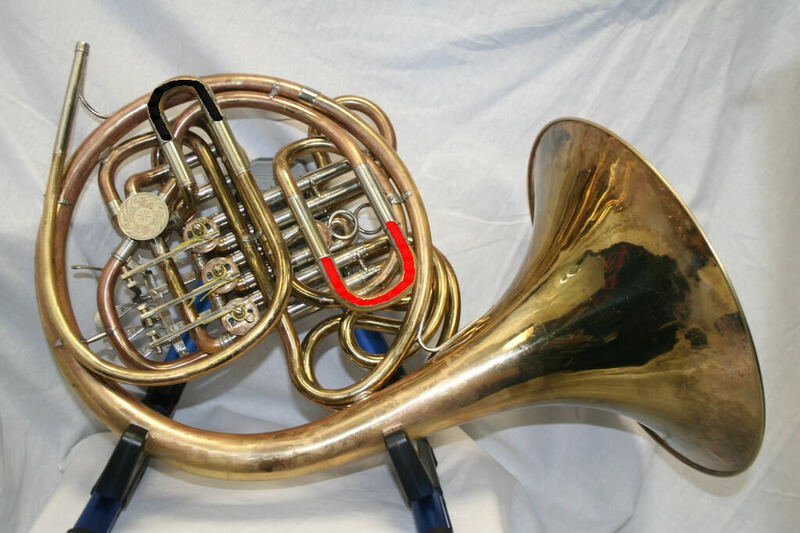 On the F horn, it’s a flat partial (if played open) and on the Bb horn it uses the middle valve (although it’s an in-tune partial). Concert F and concert Bb are both better choices (and both are often used in a band), but remember that tuning isn’t something that happens only at the beginning of rehearsal – it is an ongoing process that occurs every time you play! The tuning procedure outlined above presupposes that your hand position, posture, and air support are correct and consistent. The right hand, especially, can cause drastic changes in pitch, so if you’re hand position isn’t correct your tuning will have essentially no effect. Think before you move your slides, but if you’re out of tune, make sure to move them! Sometimes it can be hard to tell if you’re sharp or flat, but if you’re not sure, just move your main tuning slide an inch or more in one direction. You’ll either make it better or much worse – and either outcome can let you know which way you need to adjust further! The following images were graciously provided by Ken Pope over at PopeRepair.com. Thanks, Ken! Alex 103 tuning slides – front. 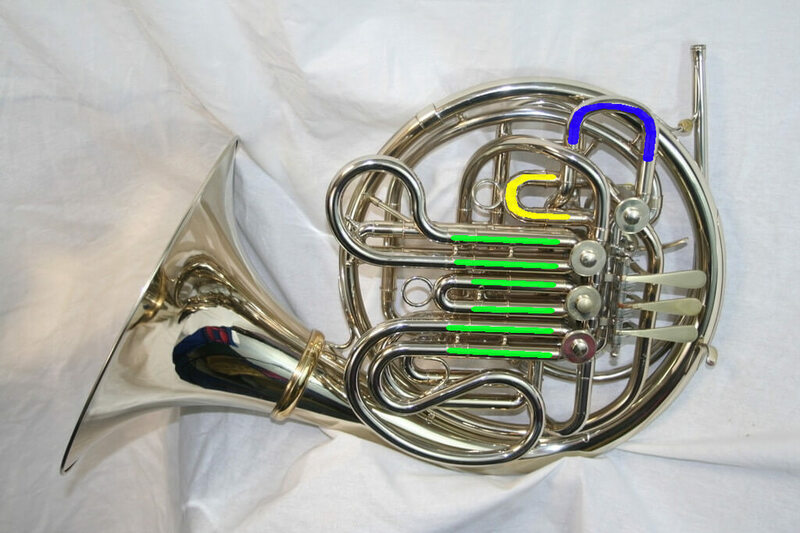 Hopefully, this helps you (or your horn students) better understand how to get and keep the double French horn in tune. If you have any questions or need some help identifying specific tuning slides on a horn, please either leave a comment below or shoot me an email via my Contact Me page.